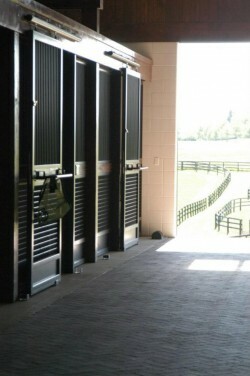 Equine friendly pavers give this barn safe footing while allowing water to pass through. Photo courtesy EVADI Farm. Paved drives and parking lots increase the storm water runoff. A solid slab of pavement does not allow water to pass through. Water flows off these surfaces into surrounding areas, increasing the amount of storm water and sediment flowing into streams and ponds. This excess runoff can also saturate pastures, paddocks and other open areas, making them unusable for grazing and turnout. Use of pavers and other paving systems that allow water to pass through them can prevent excessive storm water from running over and off these areas. Instead, the water infiltrates through or between the material components. More storm water stays within the farm’s soils or water collection systems. Less soil erodes and less sediment washes downstream. A properly installed paving system also filters out pollutants from vehicles and other sources. 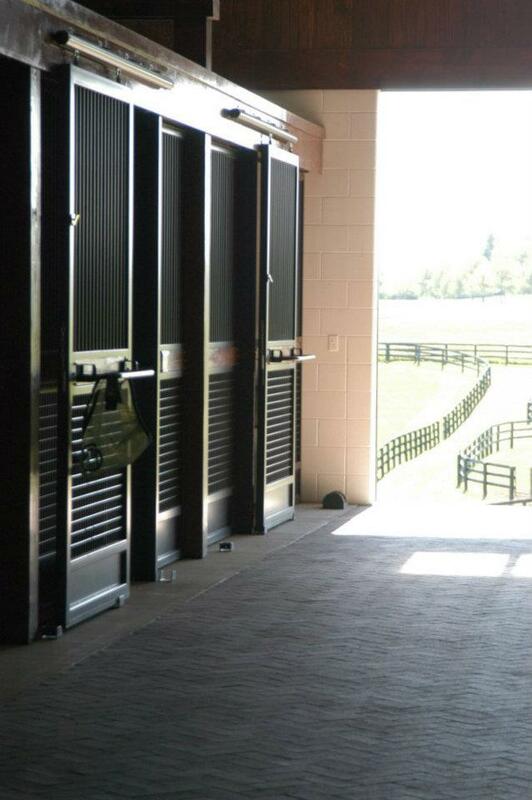 Installing pavers in stalls and wash areas, and beneath muck pile or compost areas, diminish the effects of runoff. Solid pavers placed on top of a thick layer of underground gravel allow water to absorb where it falls, minimizing runoff. Brick, concrete or a combination of other materials make up the solid pavers. Finer gravel or sand fills the gaps between the pavers. Water runs between the pavers and soaks into the gravel base. Placement of geotextile fabrics between layers of subsurface above the soil prevents sediment from working into the system and blocking drainage. These fabrics provide strength but allow water to penetrate. The addition of a system of collection pipes slowly removes water from the gravel layer. Solid materials like concrete or asphalt installed with spaces between them can provide excellent runoff management. These spaces allow storm water to soak through the pavement instead of around it. A gravel surface is simpler to install but requires a greater investment in maintenance. It usually requires a layer of larger stone below and finer gravel layer above. Gravel pavement needs regular repair. It does not hold storm water as well as other systems and washes away easily in heavy rains. Machinery to install pavers has lowered paver costs considerably. Pavers made specifically for usage with horses are the most expensive of the options but it is the most attractive and serviceable. Concrete pavers provide a more affordable option. Asphalt offers a softer surface for areas where horses stand. Shod horses can dent asphalt surfaces and high heat can melt asphalt. Asphalt requires less maintenance than gravel surfaces but needs yearly cleaning to maintain drainage. Asphalt is comparable in price to concrete. For more information about what options are available and preferable in your area, visit your Extension Office here or here.